I save my homemade barbecue sauce for the last 15 minutes of cooking. There’s a lot of sugar in barbecue sauce, and I don’t want it to burn in the heat of the grill…but want it to have at least some cooking time, to thicken it up into a glaze on the ribs. And, just for fun, my homemade barbecue sauce has a secret ingredient: a shot of coffee. That’s right, these ribs have a little wake-me-up in the sauce. First, remove the membrane from the rib side of the slabs. Work the membrane loose from one of the end bones with a butter knife, grab the membrane with a paper towel, and peel it off the ribs. Attach the first spit fork to the spit. Take a slab and run the spit between the first and second bone. Bend the slab of ribs and run the skewer between the fifth or sixth bone. Bend the slab in the other direction, into an “S” shape, and run the skewer between the bones. (Picture a s-curve, or a snake, or see the picture below.) Bend the slab the other way, and run the skewer between the last two bones on the slab. Slide the ribs down and secure them on the spit fork. Repeat with the second slab, pushing the ribs on tight. Make sure the ribs are centered on the spit, then secure the end of the second slab with the other spit fork. Remove the ribs from the spit immediately - as they cool down, they stick more to the spit. Transfer the ribs to a platter, cover with aluminum foil, and let the ribs rest for fifteen minutes, then serve. I cut the ribs into serving size pieces – half slabs for big eaters, or between every second bone for smaller servings. Pass the extra barbecue sauce at the table. I use cherry or apple for smoking wood, because they’re local to me - I had a cherry tree that had to come down in my back yard, and I have wood chunks to last for quite a while now. Hickory, oak, and pecan all work well with baby back ribs. Watch out for shiners on your baby back ribs – ribs where you can see the bone. If you can see the bone, they were cut so close that all the meat is gone. My local grocery store started carrying “extra meaty” baby back ribs a year or two back, and I love them. No coffee for the sauce? Replace it with more cider vinegar. 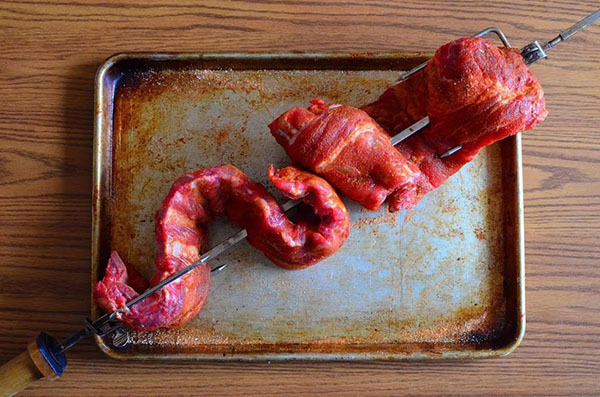 Adapted from: Rotisserie Grilling by Mike Vrobel. Visit Mike at his blog, DadCooksDinner.com. Brussels Sprouts That Will Make Your Kids Beg For Seconds!